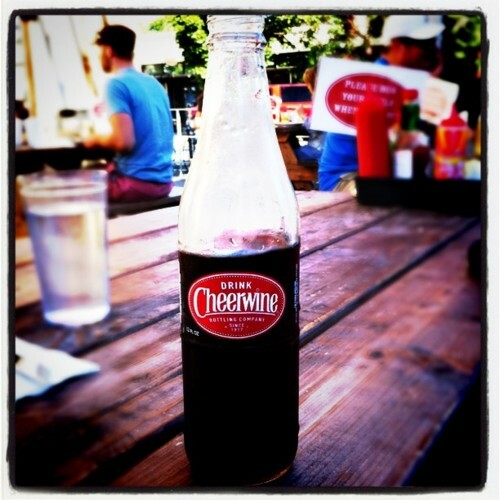 What is Cheerwine? It's not wine. 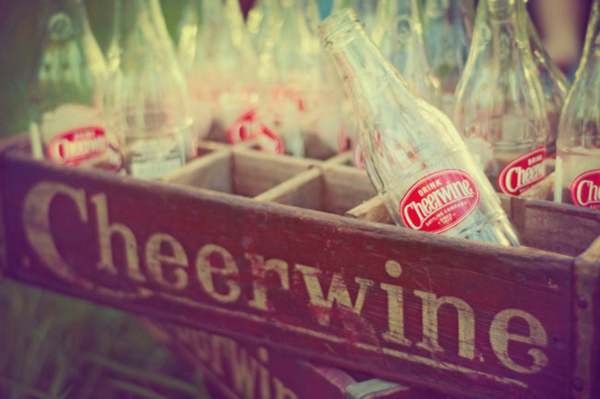 It's Cheerwine: a red sparkling beverage that has been a North Carolina favorite since 1917. Colloquially known as "The nectar of Tarheels", or "liquid candy"; our fascination with sugared water spawned two soda companies within it's borders. One being Pepsi in 1898, known as "Brad's Drink", then later changing its name, and of course Cheerwine. 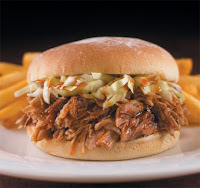 I suppose now that I think about it, North Carolina may be single-handedly been responsible for obesity in this country. Even Coke was created by North Carolinian (by birth) James Pemberton. Perhaps we should consider changing the state mantra from "First in Flight" to "First in Fizz?" 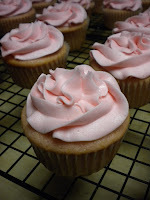 Made by the Apple Baking Company in Salisbury, North Carolina. 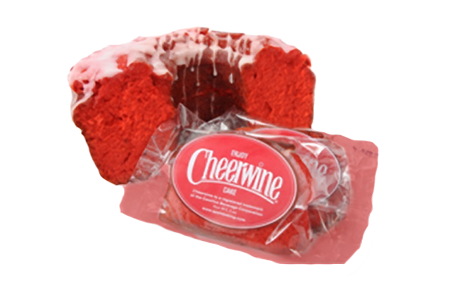 The Cheerwine cake claims you can "have your cake and eat it too." At only $12 a cake, I can imagine this may be the perfect gift for any member of the Cheerwine Cult. I'm told you can also make your own home version with a box of Devil's Food Cake and 1 cup of Cheerwine. 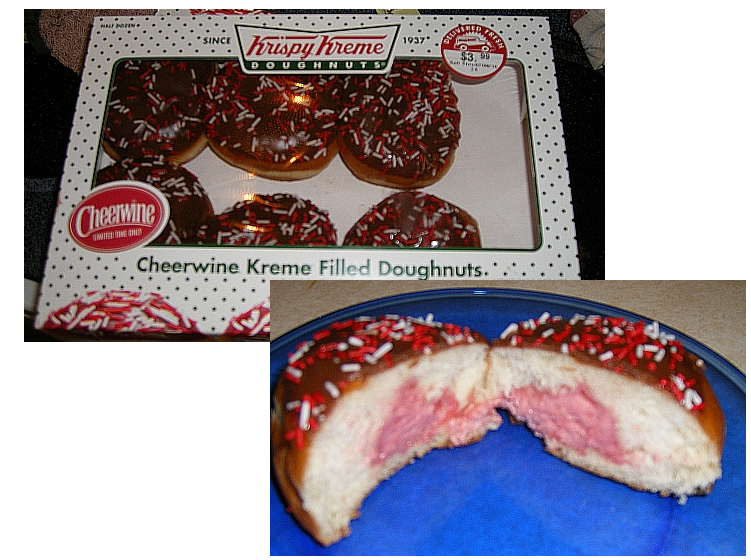 For Independence day, you can buy and freeze your years worth of Cheerwine filled doughnuts from Krispy Kreme. 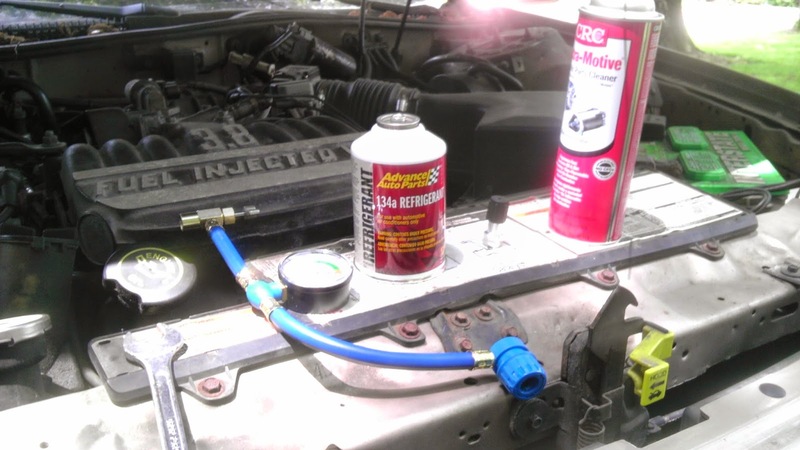 (Another native NC company.) The doughnut is actually left untouched, but they include a Cheerwine filling that you'll either love, or like me, wish it was the other way around. Reminded me a lot of cheery cordials. As with almost any niche doughnut that Krispy Kreme concocts there's always someone who tries to slice the doughnut in half, and shoves a buger in between, thus giving rise to the Cheerwine Burger. This chocolate, vanilla, and Cheerwine fudge from NC Fudge, looks out of this world to me. At $9.95, surely this is a reasonable amount of money to send happiness to your mailbox. Which gives me an idea. Think I could convince Alex down at Alex's Cheesecakes in Greeensboro to start selling Cheerwine Cheesecake? BBQ sauce made with pop? Mix, boil, chill, and use or store. Heat Cheerwine, margarine and cocoa together until mixture comes to a boil. Pour mixture over powdered sugar and blend until smooth. Stir in almond extract. Mix in chopped nuts. Cool slightly and spread over cupcakes. If you're into chocolate then there's a version of this float called the Chocolate Cheerwine Icecream Sundae Soda which I hear is out of this world. 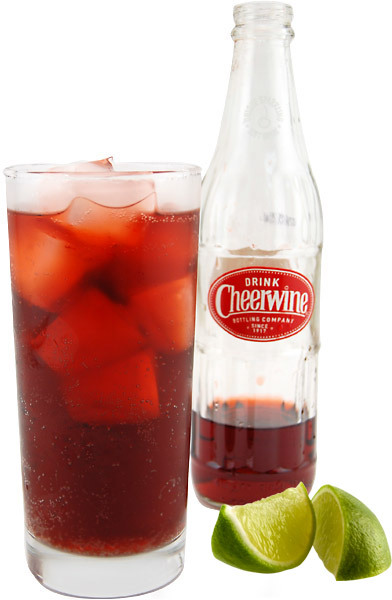 Simple add a ice-cold can of Cheerwine in a tall glass with a scoop of ice-cream and cover in Hershey's chocolate syrup, whip cream and a cheery on top. 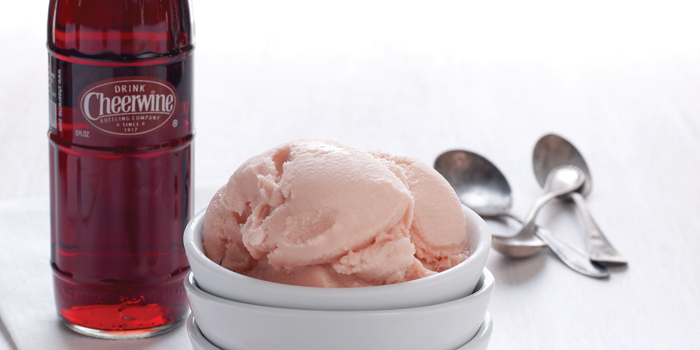 Known as Cheerwine Swirl, a combination of vanilla ice-cream and cheerwine inspired by the Cheerwine Float, in 2002, Cheerwine partnered with Belgian grocer, Food Lion to create Cheerwine Ice-Cream. 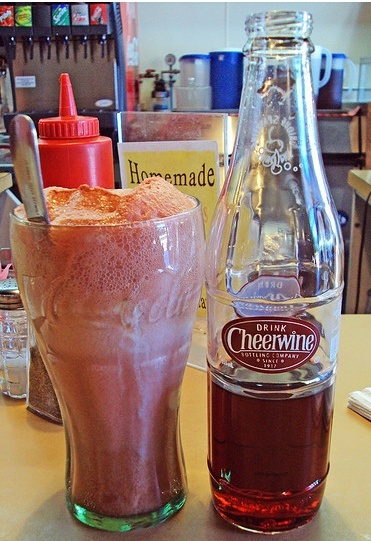 This became so successful they expanded into Cheerwine Sherbet and Cheerwine ice-cream bars, however if you want the best incarnation of Cheerwine and ice-cream, then go visit our friends at "The Table at Crestwood", a Boone, NC restaurant that serves up home-made Cheerwine Ice cream. Fill glass with with ice, add gin and juice with a splash of soda water. Top with Cheerwine and garnish with lime.